June graduated in Fine Art at Newcastle University in the early 1970s, since when she has worked as an artist and designer exhibiting her work both in the UK and abroad. June works in both oils and watercolours and enjoys producing paintings inspired by windows and reflections. For several years June has also been a keen printmaker. She started making etchings on her foundation course at Manchester College of Art back in the seventies and since coming to the North East has used the etching facilities at Newcastle University and Horsley Printmakers. 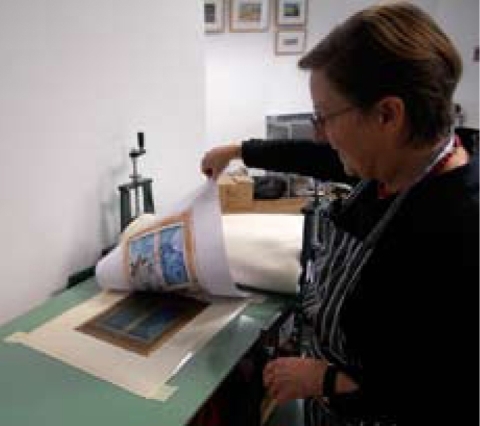 In 2012 she began using the new press at The Forge Studios, Allendale and has produced several editions of etchings and photo etchings. June writes ‘I am interested in effects which commonly occur, often for only a moment in time – patches of light, superimposed views, scenes partly glimpsed through openings, shafts of light and multiple images, so that fleeting visual experiences can be captured on paper or canvas. Light changes what we see and in my work I try to draw attention to complex effects which in the daily rush we tend to ignore’. June’s studio is located in Craster, a small, pretty fishing village on the Northumberland coast. Craster is famous for its cured kippers. The studio faces north with a sky light to bring in extra light and has a lovely view of Dunstanburgh Castle.